The book, Fabio Morais, produced by Automatica Edições, is dedicated to investigating the work of this São Paulo artist over the last ten years, which includes installations and sculptures, as well as numerous publications and artist’s books. Morais investigates, in his process, relationships and cross-contaminations between literature and the visual arts. Taking as its starting point the particularity of his practice of using books as objects and the literary universe in a broader sense, the publication sought, in its conception, to be as far removed as possible from a conventional artist’s book. The proposal here is the systematization and dissemination of the work of an original artist in the Brazilian contemporary scene who, despite having produced various books, did not possess any objective record (or “catalogue”, to use the conventional term in the artistic sphere) of his work. 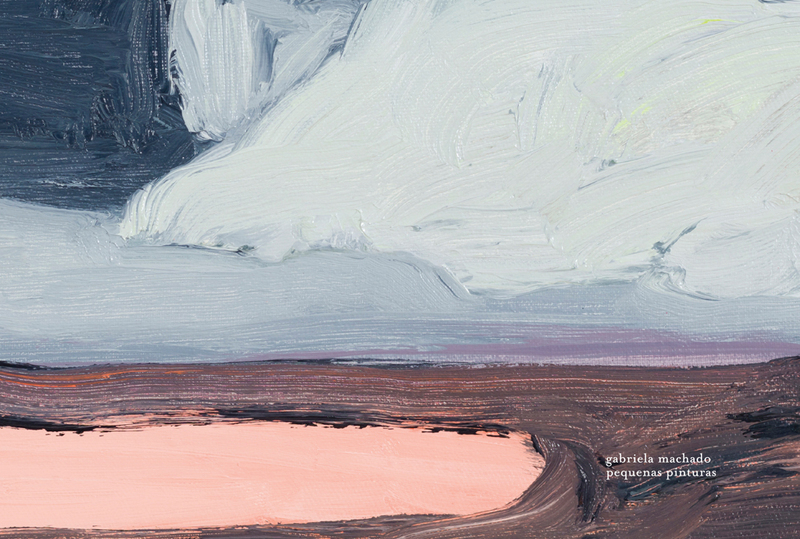 The book “Gabriela Machado, Small Paintings” presents a selection of paintings of reduced dimensions produced by the artist between 2013 and 2018. The works are organized into chapters named after the date on which they were produced and including notes by the artist. The phrase that begins the book, “this was the time I dedicated to these paintings” defines the nature of the dialogue which the artist establishes with her audience. Gabriela Machado’s work is characterized by the experimentation present in the multiplicity of media and techniques she employs, including painting, engraving, drawing, photography, collages and sculptures. A graduate of architecture and urbanism, Machado took courses at the School of Visual Arts of Parque Lage (Rio de Janeiro) at the end of the 1980s, to supplement her artistic training. She has held solo exhibitions at the Museum of Modern Art of Rio de Janeiro/MAM- Rio (2016), at the Museum of Açude (Rio de Janeiro, 2014), at the Paço Imperial (Rio de Janeiro, 1998 and 2012), and at the Bank of Brazil Cultural Center – CCBB Rio de Janeiro (2002), among other cultural spaces and galleries. Black and White is an exploration of the collection of images of the photographer, radio presenter, DJ and journalist, Mauricio Valladares. Over the last five decades, Mauricio Valladares has pointed his lens in all directions, day and night. Black and White brings together 142 analogue photographs taken between 1972 and 2003, texts by Luiz Camillo Osório and Frederico Coelho and graphic design by Christiano Calvet: A selection of images of people, with a landscape here and some architecture there. A record of famous names from the Brazilian and international music scenes, and snapshots of normal people in the streets of Rio, Paris, Rome and London. A lost world that re-emerges before Mauricio’s eyes. With this volume on the artist Gabriela Machado, the ARTE BRA collection celebrates its ninth edition. Gabriela’s work is characterized by an experimentation which is visible in the diversity of her resources and techniques: paintings, engravings, drawings, photographs, collages and, more recently, sculptures. The previously unpublished text was written by the critic and curator, Ronaldo Brito, who has followed the artista’s career for many years. Ronaldo draws attention to the “imponderable discipline of improvisation” that “renders the world visible”, and that has distinguished the artist’s work from her first paintings to the recent sculptures. The re-published texts, by Paulo Venancio Filho, Alberto Tassinari and Frederico Coelho, were written in the specific context of exhibitions, but are perfectly comprehensible when considered in relation to the work as a whole. The artist’s notebook presents collages produced between the end of 2015 and the start of 2016, made from newspaper cuttings which are then painted over by the artist. The interview was conducted in the artist’s studio in the presence of Frederico Coelho, the musician Aleh Ferreira, and the Portuguese art criticJorge Espinho. The chronology, organized by Julia Pombo, helps the reader to understand the development of Gabriela’s artistic process, an architect by training and an attendee of courses at the Parque Lage School of Visual Arts (Escola de Artes Visuais do Parque Lage) during the 1980s. From the end of that decade to the present day, the artist has held group and solo exhibitions, embarked on journeys and artistic residences, won prizes, and undertaken projects at different cultural institutions. Finally, the bibliography lists texts and videos produced by Gabriela or about her work. The book Drifters, the result of the project developed by Luiza Baldan and Jonas Arrabal, presents texts by the pair and by invited researchers, as well as images recorded during the first half of 2016 in Guanabara Bay. The name “drifters” derives from the traceable oceanic buoys distributed around Guanabara Bay. For the artistic project, these buoys were transformed into pinhole cameras by the photographer Thiago Barros to collect images of the bay. Once a week, over a period of four months, Luiza, Jonas, and often Thiago himself, set out in the boats of Prooceano/Projeto Grael, organizations dedicated to the monitoring of the seas, to collect the records caught by the buoys. On board the boat, in addition to collecting the records of the drifters, Luiza and Jonas created new images of the bay and produced reflections and texts that form part of this publishing project. The poster that accompanies the book reproduces some of the negatives recorded by the drifters. Tatiana Blass’s 176 page book contains images and descriptions of works by the artist herself, from the beginning of her career up to the present day. Tatiana produces work in different formats, including drawings, paintings, sculptures, installations, photographs and videos, and has taken part in exhibitions both in Brazil and abroad. Having graduated in Plastic Arts from the State University of São Paulo (Universidade Estadual Paulista), Tatiana Blass embarked on her career as an artist in 1998, when she began to regularly take part in salons, studio exhibitions, and group and solo shows, both in Brazil and abroad. She participated in the 29th International Biennale of São Paulo. She was a finalist at the Nam June Paik Award, in Germany. She was selected for the “Grants & Commissions” programme, of the Cisneros Fontanals Art Foundation, in Miami. And, in 2011, she won the PIPA award, by popular and jury vote, for her body of work. Using clear, concise language, this illustrated biography of Nise da Silveira documents the extraordinary life of this Brazilian psychiatrist responsible for one of the most important bodies of work in the field of psychiatry in the world. It gives a broad overview of Silveira’s life, from her childhood in the Brazilian state of Alagoas to her death in Rio de Janeiro in 1999 at the age of 94. After spending two years in prison during the Vargas dictatorship, she actively engaged in the paradigm shift in psychiatry, helping set up original institutions like Casa das Palmeiras, the country’s first outpatient care institution, which became the model for Brazil’s psychosocial care centers today, and Museu de Imagens do Inconsciente, an institution where research and experimentation overflows from the realm of science to also make waves in the world of the visual arts. The author, Silveira’s companion for her last 26 years of life, has structured this text around Nise da Silveira’s own words, taken from personal notes, interviews, and statements given in the media, giving the narrative a colloquial tone. The text is supplemented by photographs, documents, correspondence, manuscripts, dreams, and thoughts that shed light on the main events that shaped her history. The research and knowledge she produced are accompanied by a selection of pieces from the Museu de Imagens do Inconsciente collection that were decisive for her work, combining both symbolic signification and aesthetic beauty. This photobiography is based largely on documents from Nise da Silveira’s personal archives, which have just been granted protection under Unesco’s Memory of the World Program and included in the national register, which aims to identify and protect sets of valuable documentary heritage. Nise da Silveira (1905-1999) was a psychiatrist. In 1946 she founded the Occupational Therapy Service at Centro Psiquiátrico Pedro II, a psychiatric care center in Rio de Janeiro. In 1952 she created Museu de Imagens do Inconsciente at the same institution, a study and research center that safeguards the works produced in the expressive therapy workshops (paintings and models). A few years later, in 1956, Dr. Silveira, in conjunction with a group of people inspired by the same ideas, brought another project off the drawing board: the creation of Casa das Palmeiras, a clinic for treating patients discharged from psychiatric hospital, giving them free rein to engage in expressive activities. Nise da Silveira was also responsible for forming the C. G. Jung Study Group. Over the years, her research became the object of a number of exhibitions, films, documentaries, symposia, publications, conferences, and courses focusing both on occupational therapy and on the importance of images from the unconscious in understanding the inner world of people with schizophrenia. In recognition of the importance of her work, Dr. Silveira received awards, prizes, and honorary titles in different areas of knowledge: health, education, art, and literature. Her work and principles have inspired the founding of museums, cultural centers, and psychiatric institutions in Brazil and abroad. Through her work she was responsible for introducing Jungian psychology to Brazil. Nicolas Robbioas book, organized by the critic, Jacopo Crivelli Visconti, is presented in two volumes. The first of them contains texts by Santiago G. Navarro and Paulo Miyada, as well as captions of the images. The second notebooks is composed exclusively of images. The publication focuses on the work produced by the artist during the last ten years, including drawings, sculptures, installations and video stills. According to Santiago Navarro, “in his work, representation and similarity serve, [a] to explore the non-equivalence between signs, to create distance or space between signs, as a way of reconnecting them with the representation, but without seeking to restore their function of similarity”. Nicolas Robbio was born in Mar del Platé, Argentina, in 1975. He lives and works in São Paulo. A graduate of the Visual Arts School of Buenos Aires (Escola de Artes Visuais de Buenos Aires), Robbio has developed a multi-disciplinary approach using design as a tool for the study and development of its conceptual possibilities. The design of furniture and graphic objects, plastic plants or specific designs, are examples of this approach. In 2014 he staged the solo exhibition, Medos Modernos (Modern Fears), at the Instituto Tomie Ohtake, in São Paulo. In addition to this, he has exhibited at spaces such as the Fundação Serralves, in Porto a Portugal, and Bethanien Kunsthaus, in Berlin, Germany. He has also taken part in group exhibitions such as Imagine Brazil, MAC Lyon and the 28thBiennale of São Paulo (2008). The book Los Hermanos tour 2012 brings together various images captured by Caroline Bittencourt during the shows performed by the band this year. It was twenty-four performances in twelve Brazilian cities. This record becomes important because over the ten years that the band was traveling and playing without interruption did not exist a photo compilation of such quality. In his work, through a professional look of someone close to the band members, Caroline Bittencourt captures the power of music and stage presence of Los Hermanos and their unique relationship with the fans. Song Dong develops conceptual works since the 1990s, even before they were accepted as legitimate forms of art in China. The artist became known for works using modest materials that point to the impermanence of life. The book is divided into three parts: the first has a text about the experience of Song Dong in Brazil. Written by the art critic Sarina Tang, who is also the creator of the book. Responsible for bringing the artist to the country in 2013, Sarina draws attention to the similarities between Brazil and China, as the recent urbanization of their surroundings, and the marginalization of Europe-US axis hegemonic contemporary art. Then recounts the history surrounding the realization of Regenerate exhibition at Galeria Barão, in São Paulo, which was curated by Sarina. The second part of the book presents images from the Regenerate exhibition held at Galeria Barão in 2014. The third part has the text “Sweet subversion” written by the curator Marcello Dantas about the presentation of Eating the city, performance held in Brasilia in 2015. The work reproduces models of the architectural heritage of the city, made of biscuits, sweets and chocolates. Fernanda Gomes is the eighth volume of the collection ARTE BRA. The collection was created in 2007, a time when art publications were rare on the shelves of bookstores and few Brazilian artists of the generation that emerged from the 1980s had books about their works. ART BRA Fernanda Gomes was conducted in constant dialogue with the artist. Unlike the other books in the collection that prioritize the relationship between text and image, the reader will find sets of images of important exhibitions by the artist between 2011 and 2012. The critic and curator Paulo Venancio Filho was invited to write the unpublished text of the book. The author, who follows the trajectory of the artist since the 1980s, has already drawn up various texts about her work. “Inhabiting the space” has reflections on different aspects of the production of Fernanda Gomes. He writes about the relationship of the artist with the materials, taken from the disposal area, disuse and abandonment. Materials there are refined reinterpreted and replaced in the world in other condition. The republished text is authored by Lóránd Hegyi. The interview was held in the studio of the artist in December 2014 with the participation of writer and professor Fernando Gerheim, the critic and curator Felipe Scovino, the coordinator of the collection Luiza Mello and artist Julia Pombo. The conversation revolved around the creation Fernanda process, the relationship between life and art, color and light, and the importance of space. The richly illustrated chronology prioritized the many exhibitions by the artist from the beginning of her career, in Brazil and around the world. This publication wants to open a small crack of light so that a greater number of people can see and know the work of this important Brazilian artist.